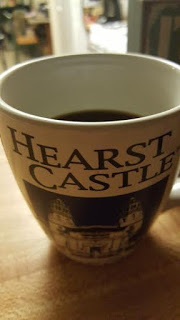 I wondered what it would be like to live in Hearst Castle. Like most who visit this adult Disneyland, where people whisper the word Xanadu out of earshot of the docents, I entered an historic womb of obscene wealth and couldn’t believe any one person would have so much. And yet William Randolph Hearst continued to want. I pictured his face, available to any Google searcher, but saw only that waif hidden under the Ghost of Christmas Present’s heavy robe as I wandered the vast estate. When faced with both Ignorance and Want, the large bearded ghost warned Ebenezer Scrooge to be particularly wary of Want. Smiling at the obvious want. Staring at Hearst’s collection of Renaissance Era art pieces, his over-the-top architectural choices made with Julia Morgan, it’s easy to see why Charles Dickens felt that way. Mister Hearst wanted for nothing, but couldn’t have everything. His San Simeon estate, larger than life and so beautiful it hurts, was never finished. Hearst wanted more there. He wanted more zoo animals, more art, much of which remains warehoused I hear, and filled his library with books and books, and books so big it would take two nerds to carry it. I stood in his bedroom, thinking about Orson Welles, and realized I couldn’t find my way back to the Hearst dining room. I’d walked in so many circles, up so many tight-fitting spiral stairs, and gasped in wonder at so many antiquated wonders, I was hopelessly lost. In this castle of oppressing opulence and wooden eyes, in a world of dotcom desire, the Hearst fortune had succeeded in polishing my own humility. I would lose my mind after two nights here. I would scream from a window and fling myself into the monarch filled garden below. It’s a pretty nice mug actually. And perhaps that’s the reason Orson Welles toiled with Citizen Kane, why the State Parks continue to bus people in to see Casa Grande daily, and why I felt the vastness of the castle like a vise rather than a dream. Others frolic the grounds and museum interior, picturing how they would rule the roost were it their own mansion estate, imagining a life full of so many riches. But I considered the sadness there and the lesson to be learned from too much of anything. Hearst brought so much to his old family campground, wanted so much more built there, but in the end the one thing he wanted most, his childhood happiness, was the one thing he could not buy. As souvenirs go, this lesson isn’t a bad way to remember the place. But the coffee mug helps too. I want a mug just like that one. And coffee tastes so good in it!